It's the second Monday of 2008, and the second week in a row that the Nintendo Wii Virtual Console has been dealt two games instead of the usual three. It wouldn't be so bad were the games in question excellent, but this week's selection...well, let's just say it isn't going to turn many heads. You might as well stop reading now. You never listen. Oh well, this week sees the addition of Pac-Attack for the SNES (800 points), a tetris-y Pac-Man game where you have to line up blocks while Pac-Man runs across the screen trying to eat ghosts. Huzzah! Also on the plate this week is Riot Zone for the TurboGrafx16 CD (800 points), a rather generic side-scrolling beat-em-up that sees two heroes fighting a mysterious organization who has kidnapped one of their girlfriends, because that's just what evil organizations did back in the day. Yay. Are they running out of stuff to toss up, or are they cutting back to get ready for WiiWare? Either way, the charm of the whole retro thing is starting to wear thin. Ready for new games now! This week you can spend your time carefully planning puzzle strategies or rescuing a damsel in distress. Help one of the most iconic characters in all of video gamedom eat some troublesome ghosts or set off to defeat an evil organization using only your furious fists. The choice is yours. What are you in the mood for? 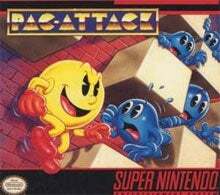 Pac-Attack (Super NES®, 1-2 players, Rated E for Everyone, 800 Wii Points): Pac-Man makes a rare appearance outside of a maze environment in Pac-Attack, a fun and quirky puzzle game. This unique entry in the genre puts its own twist on established conventions and adds one of gaming's most iconic characters to the mix. The goal is simple: Keep your screen clear of falling blocks and ghosts by lining up blocks horizontally, causing them to disappear. Clearing the ghosts, though, requires the help of a hungry Pac-Man (who just happens to swing by every so often for a snack). It's up to you to get all of the ghosts lined up for him, because Pac-Man will keep eating them until he is stopped by a block or he runs out of ghosts. In addition, his range of movement on the playing field is limited to horizontal or downward—thus adding further strategy. There are three game modes to choose from: 1 Player Normal, 2 Player VS., and the challenging 1 Player Puzzle. Feel like gobbling up some ghosts? Riot Zone (TurboGrafx16 CD-ROM, 1 player, Rated E 10+ for Everyone 10 and Older - Tobacco Reference, Violence, 800 Wii Points): Riot Zone is a side-scrolling fighting game that follows two heroes as they fight to take down an evil organization. The crime syndicate Dragon Zone has kidnapped Hawk's girlfriend and it's up to him and his partner detective, Tony, to get her back. Join them as they jump "fists first" into the grim Kowloon district. Play as Hawk or Tony and fight through all five stages in the deadly Kowloon district. Smash down the Dragon Zone goons in areas like the Harbor, Abandoned Warehouse and the Ghetto. Both characters have unique skills and attacks. Hawk is a master of karate, while Tony is a hard-hitter. That being said, both guys are massive and possess killer techniques. The hard-boiled action is enhanced by the game's realistic sound effects.